In her Ironman World Championship winning press conference, Mirinda Carfrae mentioned how she drank beet juice a few hours before the big race. You'll have to watch the video to see how that turned out! We talked about why athletes like Rinny are downing this earthy drink in this beet juice post from last fall. Lucky LaurelWe're kicking off the year with a recipe from one of our Athlete Food followers and Certified Nutrition Coach Lisa Consiglio Ryan. 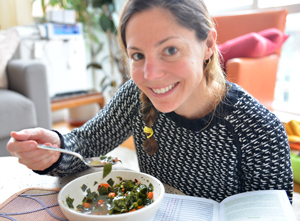 Lisa, also a Detox expert and fellow triathlete, shared this power-packed Lucky Soup with us and we thought we'd pass it along to you. With the temperature dropping well below freezing here in New York, we've been downing hot soups and beverages daily. Laurel and I made Lisa's soup before the holidays and froze it. I can't tell you how lucky I feel be able to pull it out of the freezer this afternoon. Continue reading below the photo for the recipe and to find out what Lisa has to say about it. Enjoy and thank you Lisa!